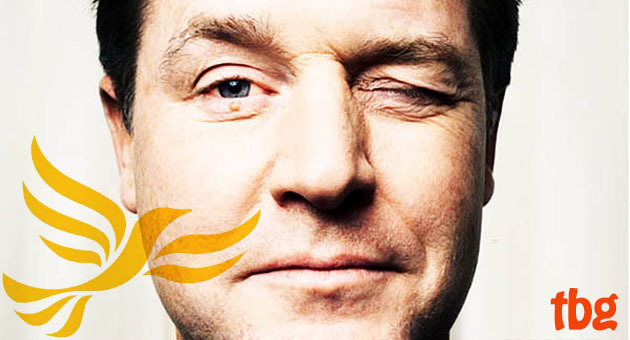 TheBlueGuerilla: Lib Dems Want to Stick With Clegg & Tory Coalition. Lib Dems Want to Stick With Clegg & Tory Coalition. LIBERAL DEMOCRATS have sensationally backed their Leader & Deputy Prime Minister Nick Clegg in a poll appearing on grassroots website Lib Dem Voice, TBG can reveal. In the aftermath of an almost total poll wipe out at the ballot box this past week polling shows 54% of Lib Dem members want Nick Clegg to stay as leader, whilst 39% want him to stand down. The poll also shows a huge majority of Lib Dem members back the coalition with the Conservatives with a staggering 81% in favour and just 16% opposing the Governing relationship. Lib Dem Voice say - "The margin’s tighter than Nick Clegg would like, but he will be relieved that a clear majority of party members in our survey want him to stay as leader." A YouGov poll for The Times this morning shows 72% of Lib Dem voters want Clegg as Leader with just 15% saying he should go.